Why Are Trans Fats Bad For Your Health? They Do What To Your Body?? Home » Eat Fat Lose Weight » Why are Trans Fats Bad for Your Health? Why are Trans Fats Bad for Your Health? Find Out About the Hidden Killer in Our Food So You Can Protect Yourself! Are you wondering, “why are trans fats bad for my health?” You are not alone! Which are the most common foods high in trans fats? These are just a few questions you’ll find the answer to here so you can make informed decisions and educated purchases when it comes to buying food or eating out. In a nutshell, trans fats (or trans-fatty acids) are artificial fats produced industrially by hydrogenating liquid vegetable oils (which go rancid easily) into more stable types of fats that are solid at room temperature, like margarine and vegetable shortenings. …Why are Trans Fats Bad for Human Health? That’s because partial hydrogenation destroys the vegetable oils’ molecular structure creating toxic trans fats – a liquid, plastic-like substance, which your body does not recognize and doesn’t know what to do with it. As a result, it isolates this synthetic substance in a special kind of protein, storing it in the walls of your aorta and other arteries throughout your body. Just stop for a moment and think about this! many degenerative chronic diseases, including diabetes, cancer, Alzheimer, cardiovascular disease. The long-term use of these deadly trans fats? Well, consumed regularly, trans fats cause the breakdown of cell membranes throughout the body, including nervous system tissues, eyes, brain, and spinal cord. And why are trans fats bad – especially for your heart health? Do you get now why trans fats are bad for your health if you consume them on a regular basis? Of course, you may be wondering, why use them in foods if they are so toxic? Well, used not only to prevent packaged foods from spoiling too fast but to also enhance their taste, trans-fats’ usage spiked with the surge in the processed foods’ production in the 1950s; nowadays they are typically found in thousands of packaged baked products and snacks all around the world. It was only a few years ago that scientists and medical community discovered the great toxicity of trans fats and their harmful effects on our health. Now, countless studies have proven that trans fats are extremely harmful for humans so if you consume foods high in trans fats on a regular basis, you are at great risk! In fact, health authorities worldwide recommend limiting the consumption of trans fats to just trace amounts. For the whole truth about deadly trans fats, why they are found virtually everywhere from your local grocery store to the finest restaurants’ menus (plus the revealing of the real reason for the long cover-up), pick up Judith Shaw’s Trans Fats: the Hidden Killer in our Food – it’s a fascinating read. 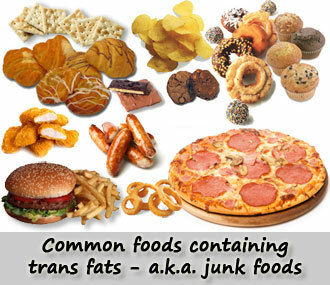 …What are Trans Fats Most Common Products? Shockingly, although in the last few years federal regulations restricted the use of trans fats, they are still up to 45% of the total fat amount in conventional, supermarket products all over North America and even more in non-European countries, which don’t have clear-cut consumer health regulations. If you care about your health, avoid these products at all costs; don’t even keep in your house anything containing trans fats. To make sure they don’t find their way in your diet read the labels – trans fats are disguised as “vegetable shortening” or “partially hydrogenated oil” on product labels; if you live in any of the developed countries you won’t have any trouble recognizing them on products’ labels, as these harmful fats are tightly regulated and must be fully disclosed on food product labels.